Motorhome stop Waterloo has 13 spacious – partly hardened – pitches with electricity. All other facilities for the guests are around the farmhouse situated. 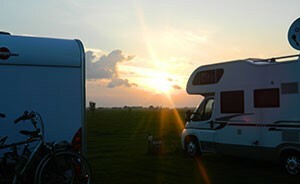 The pitches offer beautiful views over the meadows and are situated on the south (sunny) with a view to the west (sunset). The dairy cattle will be grazing from april up till november in the meadows aside the cowshed. The motorhome spot has been provided with a cosy guest room for a B&B for max. 3 persons. A washing machine, a dryer and sanitairy facilities are all there. The living room of the farm is a Tearoom for motor home guest or other guests. You need to make a reservation. The motorhome stop is child friendly, pets are welcome, dogs leashed. The motorhome stop has been regularly visited by a.o. Promobil, Reisemobil, Adac, Facile-en-Route and has been approved by them.